A traffic constable in Assam has won the praise of social media users and others for braving rain and storm while doing his duty. Mithus Das' dedication to work went viral after Assam Police tweeted a video of him standing on an uncovered elevated podium at Basistha traffic intersection directing traffic in the middle of a road during heavy rains. With neither umbrella nor raincoat, the traffic cop can be seen standing braving the heavy downpour on the busy street. Assam Police tweeted saluting the traffic cop for his "exceptional devotion". The tweet reads, "Dedication is thy name! We salute AB Constable Mithun Das (Basistha PS) of @GuwahatiPol, for his exceptional devotion towards duty and showing us how dedication can turn a storm into a sprinkle. Kudos!" The constable's video was quick to go viral on social media with people commending his commitment to work. The video has received over 2,100 likes as hundreds of comments continue to pour in. These Dancing Traffic Policemen From India Remind You No Job is Easy But Can Be Enjoyed, Watch Videos. Hindustan Times quoted Das as saying, "My duty hours were from 7 am to 12 pm. The storm started around 5 minutes before noon, but since my replacement hadn’t come, I continued my job in the rain for nearly 20 minutes. It could be a bit scary with the heavy rain, wind and lightning to stand on an uncovered podium. But for us, duty comes first." Das who is from Karbi Anglong district who joined Assam Police in 2015. 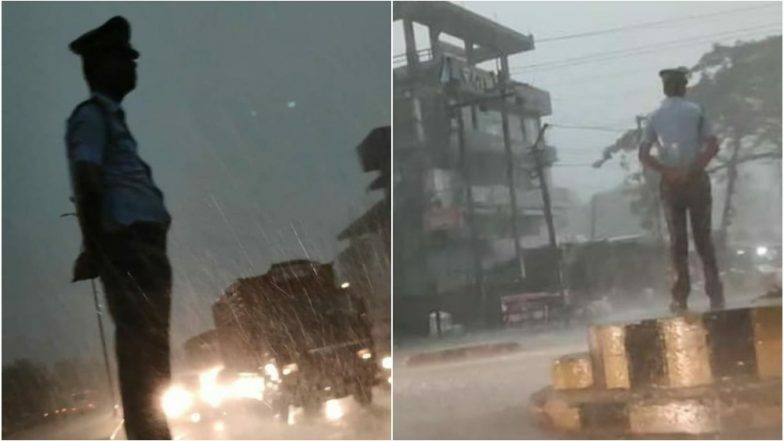 Heavy rains accompanied by thunder and lightning had occurred in different districts of Assam including Kamrup (M), South Salmara and Nalbari on Sunday. Bengaluru Traffic Police Offers Water to Hurt Pigeon on Road, Good Samaritan Reaps Praises on Social Media. Assam Special DGP (Law & Order) Kuladhar Saikia also praised Das saying, "Personnel like him, who stand against such adversities everyday, without being recorded." The visuals of the traffic Constable Mithun Das (Basistha PS) are truly inspirational. I personally talked to him and conveyed my appreciations. I also hail all the @assampolice Personnel like him, who stand against such adversities everyday, without being recorded. Guwahati police commissioner Deepak Kumar said, "Traffic gets more congested during rains and Das who was responsible for managing the busy Basistha intersection showed that no matter what the circumstances are, duty comes first. We are very pleased with Das’s exemplary act and will soon award him." Meanwhile, a Twitter user said that the intersection "is one of the busiest intersection of Guwahati connecting Shillong, North Assam cities to Airport and southern Assam and also Dispute, Paltan bazar, pan bazar to Basishtha".